At present tapped wood of black pines (Pinus nigra var. austriaca) is mainly combusted. The priority of material use over thermal recycling has led to some considerations regarding the utilization of tapped wood. The high content of extractives suggests a higher natural durability, and therefore, the suitability for outdoor applications. Tapped and not tapped wood boards from black pine (sapwood and heartwood) were subjected to weathering tests to find out its resistance against abiotic stress. Additionally tapped wood particles with a high content of resin were exposed to weathering and to composting. Weathering caused roughness to increase. Infrared spectral characteristics revealed the differences before and after tapping and weathering. Principal component analyses supported the grouping according to the chemical changes. In heartwood the lignin band at 1510 cm− 1 disappears and the typical resin band at 1688 cm− 1 decreases considerably. The lignin band of resinous parts is affected neither by weathering nor by composting. However, the resin band shows an intensity decrease and broadening due to weathering and disappears during composting. Due to the high content of extractives Pinus nigra var. austriaca was tapped for resin in the past in some regions in Lower Austria. Resin from pines provided the raw material for chemicals such as turpentine and colophony that have served as precursor for diverse products such as mixtures of paints and colors, soap and pharmaceuticals since medieval times . Gangemi  reports on the different interests in this raw material and on the effects of historical pitch production in Italy. In the middle of the twentieth century natural resin was replaced by mineral oil-based chemicals. Therefore, the trade has been rigorously reduced in Europe. Since 2012 resin tapping has been part of the cultural heritage in Lower Austria, but only a few people exist who are proficient in this practice . Today natural resin is used for some niche products, e.g., balms. Colophony from natural resin plays a role to improve the sound of string instruments . The lesions caused by resin tapping lead to several physiological reactions of the tree. On the one hand, resin production is stimulated and on the other hand the tree tries to close the lesion by bark, which effects irregular growth and anomalous annual rings. Therefore, interest conflicts with wood production are inevitable. They are reported for Austria by Mazek-Fialla . Gayer  described the negative impact on plant growth and wood quality. Thus, material utilization of the tapped trees is, therefore, limited and incineration has dominated. Up to now the processing of this material has focused on some special applications, e.g., wooden floors in theaters, fences of paddocks and handicraft. Due to substantial stocks of Pinus nigra var. austriaca in Lower Austria, there are some considerations regarding the material utilization of tapped pine wood. Tapping causes the resin to fill the pores which results in a massive wood. Due to the high content of extractives tapped pine wood is thought to be resistant against weathering, and therefore, appropriate for outdoor applications. According to resource management and the priority of material recycling over thermal recycling there would be a potential for cascading of tapped wood. It was the objective of this study to test the timber of black pine regarding the behavior under abiotic and biotic conditions. The abiotic test focused on physical weathering including a sequence of UV radiation, temperature and humidity over a period of 12 weeks. The resulting effects were characterized by means of (Fourier-Transform Infrared Spectroscopy) FT-IR spectroscopy and roughness measurements. Furthermore, resinous wood was added to a composting process. Chemical changes were also revealed by means of spectral features and compared to abiotic effects. Black pines originated from the Piestingtal (Lower Austria, 47°55′10″N 16°08′40″E) with a humid, temperate climate. Five tapped and five not tapped black pines were available. Planed boards of 30 × 8 × 1 cm were produced from the stem section between 1 and 2 m height. They were used for the weathering tests. The boards were produced from sapwood and heartwood separately, additionally the parts strongly enriched in resin due to tapping (named “resinous” throughout the paper). Weathering tests were performed on a Q-Lab ® QUV/spray. Test parameters were set according to BS EN 927-6:2006 . The cycle of one week is summarized in Table 1. This cycle was repeated 12 times (= 12 weeks). Ten small particles (2 × 1 × 0.3 cm) of the resinous parts were subjected to an open composting process on the laboratory scale. They were added to the compost mixture containing fruits, vegetables, yard waste and bulk materials. The composting process took place during 3 and 6 months in a rotting box (80 × 40 × 40 cm) at room temperature with regular turning and moistening. The temperature within the windrow did not exceed 55 °C. For FT-IR measurements of resinous particles compost residues were removed from the surface. Infrared spectra were recorded at the surface of the boards before and after weathering and after co-composting of the resinous particles. Spectroscopic investigations were carried out with a Tensor 27 (Bruker ®, Ettlingen) in the mid-infrared area (4000–400 cm− 1) using the ATR mode. 64 scans were performed and corrected against air as background. The spectral resolution was 4 cm− 1. Eight–ten spectra per board were recorded and vector normalized with the Bruker software OPUS 6.5® (Bruker, Ettlingen). The measurements were performed on a Taylor Hobson® Form-Talysurf 2 50i. Experimental data were set in a factorial design with the factors tapped/ not tapped, type of the board (sapwood, heartwood, or highly resinous parts due to tapping) and before/ after the accelerated weathering test. Principal Component Analysis (PCA) was calculated with the software Unscrambler X 10.1® (Camo, Oslo) to display the influencing factors . Analysis of Variance (ANOVA) and Boxplots were performed with SPSS 21® (IBM, Armonk). Additional FT-IR spectra of resinous samples before and after weathering and co-composting were subjected to a PCA. Two main processes are assumed to take place under the conditions of the accelerated weathering test. According to the literature changes in the resin content due to temperature and photodegradation of lignin due to UV radiation could be expected [9, 10, 11, 12]. PCA were, therefore, based on the wavenumber range 1930–400 cm− 1where relevant bands contribute to sample segregation (Table 2). The influence of tapping and weathering on sapwood and heartwood is shown in the Scores plots of the PCAs (Fig. 1a, b). The overlapping groups indicate that sapwood is not affected by tapping, whereas weathering causes chemical changes (Fig. 1a). They are explained with spectral characteristics in Fig. 2. Interpretation of PC can be done by the loadings (plots not shown). For sapwood the main bands relevant for the segregation are related to lignin (1510, 1260 and 1217 cm− 1) and the broad region with superimposed bands around 1050 cm− 1. It demonstrates the major impact of weathering and the minimal effect of tapping on sapwood (seen in the scores of Fig. 1a). Heartwood and tapped heartwood are partly separated (Fig. 1b). According to the loadings plot of the first principal component (not shown) the band at 1688 cm− 1 is responsible for the grouping. Segregation due to weathering takes place along the second principal component, where additionally also the lignin band of 1510 cm− 1 is relevant. With regard to weathering there is no difference between tapped and not tapped sapwood and heartwood, respectively. Tapped and not tapped samples overlap. Resinous parts before and after weathering are segregated as well by the third principal component (Fig. 1c), where the typical resin bands at 1690 and 1276 cm− 1 dominate the loadings. The average spectra of resinous wood and heartwood of tapped pines before and after accelerated weathering indicate the responsible regions for sample segregation. They are displayed in Fig. 2. Weathering causes several changes. The concerned bands are listed in Table 2. The band at 1510 cm− 1 (lignin) almost disappears, whereas the bands in the area from 1240 to 1030 cm− 1 (cellulose) show a relative increase. The chemical process is paralleled by a noticeable change of color from brown to gray. The band at about 1688 cm− 1 that can be assigned to the carbonyl stretch vibration of resin acids, features the most distinct change. The decrease of band intensity is weaker in resinous wood than in heartwood where the decrease of this band is paralleled by the relative increase of the C–O–C vibration (cellulose) at 1030 cm− 1. Changes of band (resin acid and lignin) intensities due to accelerated weathering are shown in Fig. 3. The boxplots reveal that the lignin band of resinous parts decreases to a comparable level with sapwood or heartwood. We focused on this specific band, as it is the most unmated band assigned to lignin. It has been used as the only band to predict lignin content . All the other lignin bands are more or less superimposed by vibrations of other molecules. The resin content remains at a higher level, whereas in heartwood samples the resin band decreases strongly. The band at 1688 cm− 1 has been assigned to the carbonyl-group specific for resin in resin channels . For practical applications, the results indicate that the weathering of lignin on the surface is not changed anyhow by the resin content. For an outdoor application of such boards we might suggest a certain delay but no substantial prevention effect of weathering in terms of graying. The composting process and accelerated weathering of resinous wood particles led to different chemical changes after 12 and 24 weeks, respectively, as revealed by spectral features. Figure 4 compares the spectral characteristics of resinous wood and resinous wood that was subjected to a composting process for 12 (resinous wood composted 12 weeks) and 24 weeks (resinous wood composted 24 weeks). Whereas the aromatic skeletal vibration of lignin at 1510 cm− 1 decreases considerably due to weathering (see Fig. 2), the band is not affected by composting. Due to the composting process the main resin band at 1688 cm− 1 shows a more conspicuous reduction. The lower intensity of this band is paralleled by the decrease of the bands at 2815 and 2865 cm− 1 that are also assigned to resin acids, whereas the band at 3320 cm− 1 (O–H vibrations) increase. In the scores plot of the PCA (Fig. 5) resinous wood and composted resinous wood samples are located along the first principal component. The groups partly overlap. According to the loadings of the first principal component the bands at 2925, 2865 and 1688 cm− 1 (resin acids), and the region 1240–1030 cm− 1 (cellulose) contribute to sample segregation. Two samples that were composted for a longer time are located in a major distance. Weathered resinous wood samples are separated by the second principal component. Bands at 2925 and 2865 cm− 1 and the region 1240–1030 cm− 1 (cellulose) are also responsible for the grouping, but the strongest effect is caused by broadening and shifting of the band at 1688 cm− 1. The results obtained demonstrate the behavior of resinous wood in applications next to and beyond the soil surface. Composting can be seen as an accelerated test for these conditions. Even with the quite small experimental setup the results suggest that resin might protect the wood structure from microbial attack at least for a certain time till the resin itself is reduced. Further experiments could specify this effect. Figure 6 shows the effect of weathering on surface properties. The chemical change is paralleled by a relevant increase of roughness. Before weathering sapwood, heartwood and resinous parts of tapped wood feature similar results. Weathering leads to higher roughness. Sapwood is more affected than heartwood. Not tapped softwood and heartwood show higher roughness than the tapped sample. Nevertheless resinous parts are mostly affected by weathering. The weathering test leads to a relevant decrease of resin and lignin contents in tapped black pine wood. Roughness and color of the surface are highly affected. The stability of tapped black pine wood in terms of outdoor utilization rather focuses on the resistance against microbial attacks than on abiotic factors. According to the literature, abiotic weathering leads mainly to a destruction of lignin, whereas cellulose stays more stable. The main difference of tapping is the resin content, especially the highly resinous parts under the directly tapped part of the trunk. This resin featured more stable characteristics than lignin. Its characteristic band at 1688 cm− 1 in the FTIR spectra was reduced after weathering, but at least at the highly resinous parts a certain amount remained. 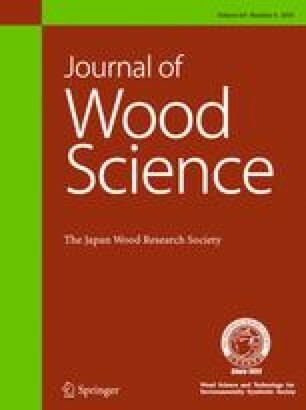 Despite higher roughness that can be explained by the decreasing lignin content, it can be concluded that the resin content protects wood against a subsequent biotic stress. The composting process affects more the resin acids, whereas the lignin (1688 cm− 1) and cellulose (1026 cm− 1) bands appear more distinct in the spectrum. It seems that a thin surface layer of resin protects lignin and cellulose. Further research of long-term composting experiments (> 12 months) will show, how wood components are affected after the destruction of the resin coating. Open access funding provided by University of Natural Resources and Life Sciences Vienna (BOKU). Many thanks to Gerhard Emsenhuber for the measurements of roughness and the accelerated weathering. Thanks to Herbert Kohlross, Michael Grabner and Czernin`sche Forstverwaltung for trees and sample preparation. The research was financed in the course of the Sparkling Science Project SPA 04-191.